We have had hogs for several years now. The damage they do to the land and crops is beyond belief. We have tried our best, but evidently, we can't get rid of them. But, that's why we're doing the hog hunts; we have to try. We started out shooting them in the daytime and had limited success. 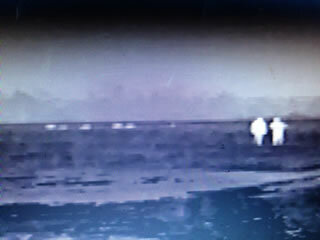 After requesting depredation permits from the state, we then moved to hunting them at night with lights and over bait. That was a lot better than when we just sat and hoped they would walk by. We spent a bunch of money on fancy red and green lights that attached to rifles, but found out that, unlike deer and coyotes, hogs could see those things and learned pretty quickly what they meant. We then spent some more money and bought some of the digital night vision. That was way better than lights but were only good for one shot at less than one hundred yards. By the time the scope recouped from the flash of the first shot, the hogs were running and you couldn't find them anymore. But, at least they didn't run before you started shooting. You got one good shot in. Wanting to see further, we then purchased third generation white phosphorus night vision. Man, that was a step up. They were pretty pricey, but we could then really see in the dark. 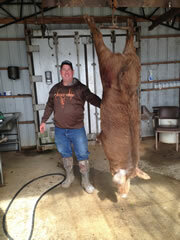 We could see 750 to 1000 yards, make multiple shots on hogs and killed way more. Then, we realized that if one got cut on in too much light that the intensifier would burn up in just a short while. And after paying to replace an intensifier, we decided to find something better. We found thermals. Life is complete. We finally found the perfect hog killing method. We can see in the dark, make multiple shots, see hogs in the brush, and even spot them at 800 yards. 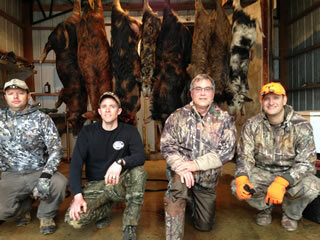 We have utilized the thermals to their fullest extent and have killed hundreds of hogs, but we still have more. We hope everyone will come help us at least keep them at manageable numbers. You are welcome to bring any type weapon that you like, hunt day or night and kill as many as you can. I can't guarantee what you see or kill, but I will assure you that we put you where we think that you have the best chance to kill the most hogs. We have weapons and ammunition that we provide for free and we also rent the thermal rifles. We don't push the rental weapons, and it's more expensive, but I will say that the thermal guys usually kill three to five times more hogs than the light guys. Whatever type hog hunt you want, we are just proud that you come. We need all the help that we can get to try and keep the hogs from putting us out of the farming business. We clean and quarter all the hogs you kill for free. If you don't want some of the hogs, we have people that will take them. We hope that you fill all your coolers and have to go get more.